This post is part of a series: the Big Bed Quilt-Along. We're sewing along February - April 2018, but you can use the resources anytime to help you make a large quilt. Use hashtag #BigBedQAL to share your progress! Most of my quilt backs are pieced from random yardage from my stash. It's satisfying to use what I have, keeping my stash in check. But when it comes to a very large work, like a quilt for a queen or king size bed, I prefer to purchase yardage for backing. Based on the quilt backings our longarm quilting clients are sending, I'm not alone. What works best as backing for your big bed quilt? Here are some important considerations. Special thanks to The Warm Company, our March Quilt-Along Sponsor! This term refers to the kind of fabric you'll use for backing. Generally, it's wise to use the same substrate as your quilt top. Usually, that's quilting cotton. If, however, you've used something such as lawn or flannel for your quilt top, consider using the same on the quilt back. This will enhance the unique properties that drew you to that special substrate. What about sheets? Some quilters are happy to use quilts as backing, while others regret the experience. Check that the sheet is 100% cotton, not a poly-cotton blend. Cotton will wash and feel more like your quilt top. Also, make a small test quilt sandwich with the sheet to see how it sews. Sometimes a sheet's tight weave resists quilting. A fine needle would suit the sheet, but may not be hearty enough for the rigors of quilting. 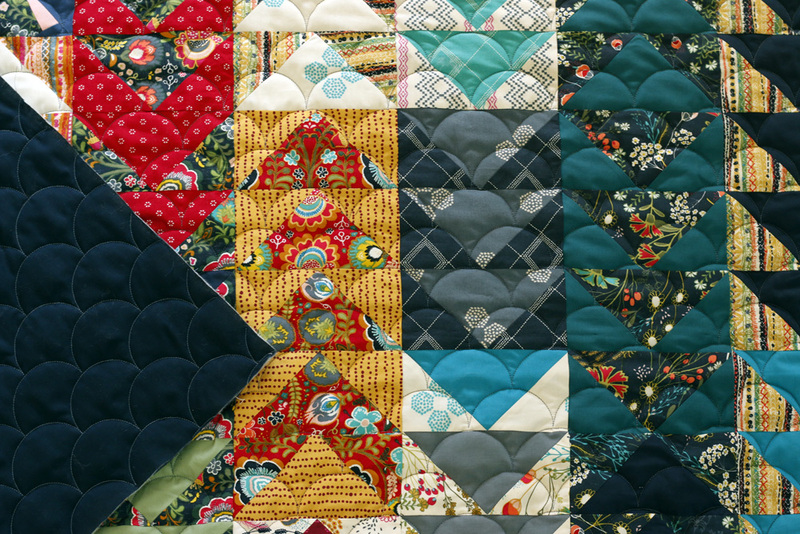 Are you considering pairing your quilting cotton quilt top with something cozy, like flannel? Be aware that flannel and minky stretch. On such a large project, this could be too much of a challenge. If you plan to send your quilt out to be longarm quilted, ask if your quilter is able to work with specialty substrates. Should you buy regular 44" wide yardage or shop for a 108" wideback? I say go for the wideback all the way! It's actually a more cost effective and saves you time to boot! Plus, longarm quilters love wide width backings. They are strong, square and easy-to-load. Unfortunately, not all stores stock wide width fabrics. Two of my sponsors, Gotham Quilts and Pineapple Fabrics have nice selections! I've recently learned the importance of choosing backing color with quilting thread color in mind. Of course you want the quilt back to coordinate with the quilt top. But, beyond that, your choice of backing fabric color makes a big impact on how bold the quilting appears from the back of the quilt. Will you want to quilt the work in a light colored thread? Be cautious then about choosing a medium to dark colored backing. Stitch quality is best when the same colored thread is used as top thread and bobbin thread. Light colored thread is going to make the quilting really pop on a medium to dark backing. This may be just the effect you want... or not. Especially if you are quilting the work yourself and feel self-conscious about your quilting skills, you may prefer to choose a backing color that matches the quilting thread. We just longarm quilting a beautiful flying geese quilt for a customer. She was nervous about thread choice because she had chosen a dark navy backing for the quilt. Her first instinct for the quilt top was a light colored thread, but she knew she wouldn't like a pale thread on the navy backing. I concurred and suggested a steel gray thread. I think you'll agree that it all worked out beautifully! But, it did cause her some stress and worry, and she's not the first customer I've helped in this situation. Quilting thread color as related to backing color is something worth considering. Will you back your quilt with a solid or understated texture or with a bold, busy print? Reach for a solid or near-solid when you feel confident about your quilting and wish to see it clearly from the back of the work. Consider a more busy print when you prefer for the quilting to blend. If you will be piecing the backing from regular-width yardage, avoid prints that would need to be matched in order to disguise the seam. Matching on such a large scale project is tricky and requires the purchase of much excess fabric. Happy Hunting for your ideal backing!